VATS replacement. Bullet Time that can be toggled on and off using hotkeys. 3 levels. 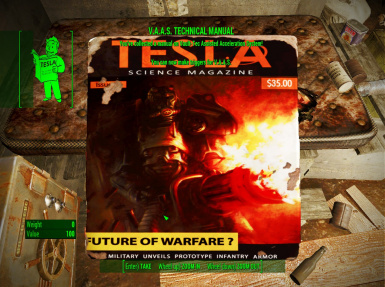 When Tesla Science magazine published "Future of Warfare" over 200 years ago, certain lucky subscribers received a companion issue describing a breakthrough in V.A.T.S. technology. 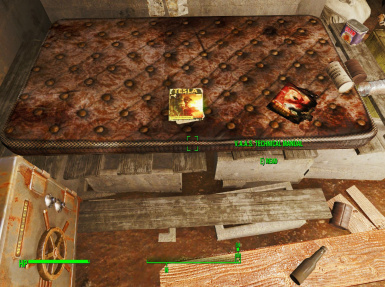 With the knowledge found in this companion issue called "Vault-Tec Assisted Acceleration System Technical Manual", lucky owners of Pipboys can unleash the true potential of V.A.T.S.! Accelerate your reflexes just like V.A.T.S., but trade the targeting subsystem for the ability to act freely! Adds 1 perk magazine, 1 new perk and 4 craftable and equipable items which allow players to toggle bullet time on and off using hotkeys. VAAS Deactivator = Switches off VAAS. VAAS Mk I = Slows time to 30% (same as Jet). VAAS Mk II = Slows time to 4% (same as VATS, recommended version). Effects will end once AP reaches 1 or less, or when deactivator is equipped, or when the triggers are unequipped. Triggers are crafted using the Chemistry station, under "Utilities"
In the Pipboy inventory page, the crafted triggers will be shown in the "Weapons" category. They do not take up any weapon slots to equip and will not impede your use of guns/melee weapons/grenades/unarmed etc. Revamped the AP drain. There are 3 versions now. Manual - Extract the "Interface", "meshes" and "sound" folders to the Fallout "Data" folder. Then extract the version of the esp file you want from the respective "APDrainBalanced", "APDrainHalf" or "APDrainZero" folder to the Fallout "Data" folder. NMM - Uninstall old version and install this version. Manual - Extract the version of the esp file you want from the respective "APDrainBalanced", "APDrainHalf" or "APDrainZero" folder to the Fallout "Data" folder and overwrite the old version. 2) The perk allows triggers to be crafted at the Chemistry Workbench under "Utilities". Besides crafting your preferred version of the 3 activation triggers, I recommend crafting the "V.A.A.S. Deactivate" trigger as well, so that deactivation can also be hotkeyed (which is the main reason I wanted to make this mod). 3) Once triggers have been created, bring up Pipboy inventory and go to the Weapons tab. Set 1 hotkey for your preferred trigger, set another hotkey for "V.A.A.S. Deactivate". If you like, you can craft all 3 triggers to see which on you like best. Or hotkey all of them to use in different situations. 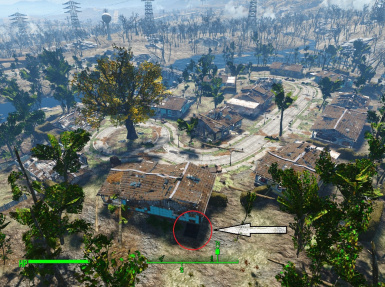 All 4 triggers uses the same Weapon slot (called "Others" when viewed in FO4Edit). Only 1 trigger can be equipped at any 1 time, and will thus de-ativate the others. 4) Use hotkeys to activate or deactivate whenever you need. You can still go into Pipboy to unequip/deactivate of course. - Revamped AP costs to 60 AP/sec for all 3 triggers in the balanced version, 30 AP/sec in the Half AP version, and added a 0 AP version. - Made an FOMOD installer. - Removed all new keywords and replaced references with default in-game ones. Doing this as other mods I am using have used up the keyword "quota". The triggers are still crafted at the Chemistry sation, but is now listed under the "Utilities" section. - Triggers are now invisible (I basically pointed them to a non-existant mesh to fix the issue with the triggers floating around the hands). I've not found a way to apply armor mods to weapons that will turn them invisible. I'll update this once I find a better way to do it. Please let me know if you encounter issues (eg big red exclamation mark when you drop the trigger on the ground. It's not happening to me when I tested though). 1) If the slow time effects do not disappear dispel fast enough after deactivation, bring up the Pipboy screen and exit. An alternate method that works is going in and out of console (thanks HSneak for this tip!). 2) The effect I am using is an exact copy of the in game Jet effects. 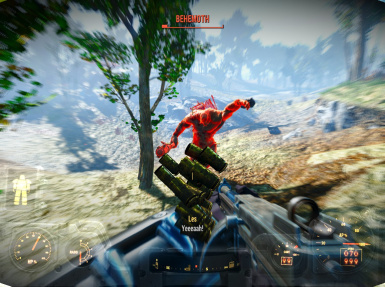 Pushing it to go beyond the 0.3 slow time level can result in some situations the effect was not made to handle - such as falling very slowly, having to wait for doors to open, temporarily freezing in place when hit by staggering effects. 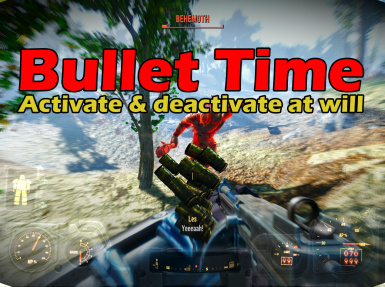 There are a few Bullet Time mods already, but I wanted something that is fire and forget, and ends when I wanted it to. AP usage seems quite high, but is hard to balance. The benchmark that I used is that even a 1 Agility character can use Mk I for 6-7 seconds. With armor mods that grant AP/increase AP refresh, and consumables that restores AP, this shouldn't be an issue. Plus, the more advanced versions are more efficient since AP cost only increase by about 50% per upgrade, while effect is increased by about 900%. Minutes after uploading the new version, I did a search and found that registrator2000 has made the Bullet Time mod that I have been looking for and it works great! (I made mine only as a stop gap until someone with more talent than I makes a better one).